Join Us!!! We are looking for someone to help us cover IBL basketball. Please send us an e-mail. Bryan Hunter will be stepping down as Head Coach of the Vancouver Volcanoes for the 2012 International Basketball League season. Hunter will retain his position as the teams General Manager and has tabbed his former Assistant Coach, Joe Navarro , to take the helm in his place. Navarro, a Player Scout for the the Los Angeles Clippers working with General Manager Neil Oshley also continues to conduct individual workouts for NBA players. In the IBL he has served as an Assistant Coach for the Volcanoes for the past two seasons. If that wasn't enough, Coach Navarro has spent the last eight years courtside as an Assistant at Concordia University in Portland. Getting his start at North Marion High School in Aurora, Ore., and Warrenton High School, Navarro has the ability to recognize talent and knows how to put a team together. Joining Navarro on the sideline will be longtime Volcanoes swingman Kevin Bloodsaw (6'5''-G/F-72, college: Ozarks), who helped his team capture the IBL Championship in 2011. One of just three players to play in the IBL every season of its seven-year history, Bloodsaw finishes his professional career as the leagues all-time leading scorer with 2252 points. In addition to his playing career, Bloodsaw has also spent the last four seasons serving as head coach of Life Christian High School's boys basketball team in Aloha, Ore.
Navarro and Bloodsaw will make their debut as the Volcanoes open the 2012 season and raise their 2011 IBL Championship banner on Saturday, April 28 at the O'Connell Sports Complex at Clark College. A full schedule and news on the teams roster for the 2012 season will be announced soon. 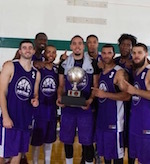 The Bellingham Slam received a late game-tying put-back from center Austin Bragg (6'9''-F/C-91, college: W.Washington), then pulled away in overtime as they defeated Team Worldwide in a Seattle Pro-Am thriller, 110-103, at Royal Brougham Pavilion on Saturday. Remarkably, it was the first time the Slam had posted an overtime victory in team history, having gone 0-for-5 in previous games which required extra time. Thanks to hot outside shooting from forward Jordan Hamilton (6'7''-F-90, college: Texas), the Slam built up a 14-point lead halfway into the third quarter, at 70-56. But Worldwide rallied late in the frame, closing with a 12-0 run to trim Bellingham's lead to one, at 73-72. The fourth quarter featured some riveting back-and-forth play, with Worldwide eventually building a five-point lead, at 94-89, with three minutes left on a bucket by forward Nahziah Carter (6'6''-G/F). The Slam got within two after Hamilton sank a three, his sixth of the game, with two minutes to go, and then tied the score at 94-94 a possession later on free throws from guard Paul Hafford (6'5''-G/F-84, college: Portland St.). Worldwide briefly took the lead back when former Husky center Robert Upshaw (7'0''-C-94, college: Washington) scored with under a minute remaining, but Bragg made sure the game went to an extra session as he scored with just seconds left, battling down low in gritty fashion as he converted a put-back on a third try following a miss and blocked shot. Bragg opened overtime with a statement dunk just 10 seconds in to get the Slam off on the right track, as the never trailed in the extra period. A pair of floaters from guard Preston Vermeulen (6'2''-G-83), suiting up for the Slam for the first time, helped push the advantage to six. The Slam slipped slightly midway through overtime, as a pair of sloppy possessions allowed Worldwide to get back within one, at 104-103, but guard Morris Anderson (6'3''-G-87, college: W.Washington) helped to ice the victory by scoring twice off of timely turnovers by Worldwide. Hamilton led all scorers with 37 points, marking the first time this season a player other than Taylor Stafford, who did not play, earned high scorer honors. Bragg enjoyed his best game of the season with a double-double of 21 points and 13 rebounds, while Vermeulen finished with 16 points in an impressive Pro-Am debut. Not to be outdone, Anderson quietly posted a triple-double consisting of 14 points, 10 rebounds and 11 assists. Team Worldwide was led by the 35 points and game-high 20 rebounds of Robert Upshaw. With the victory, the Slam's 2017 regular season is complete and the team now awaits the finish of the rest of the league's schedule on Sunday. With a 5-3 record, the Slam has clinched a Pro-Am postseason berth but must wait to learn the opponent and start time for their first round playoff game, which will take place on August 19 at Royal Brougham Pavilion. The Bellingham Slam received contributions from a number of former Western Washington University players as they routed the Kitsap Admirals, 110-89, in Seattle Pro-Am action at Royal Brougham Pavilion on Saturday. Led by guard Taylor Stafford (6'1''-G-94, college: W.Washington) who tallied a game-high 38 points, seven ex-Vikings scored the Slam and accounted for over two-thirds of Bellingham's total offensive production. Stafford dazzled the crowd with perhaps the best shooting performance of the Pro-Am's young season. He finished with five three-pointers and was 9-for-11 on his shots from inside the arc. Leading 49-42 at the half, guard Paul Hafford (6'5''-G/F-84, college: Portland St.) opened the third quarter with a three-pointer and sparked a 14-2 run for the Slam which extended the lead to 63-44. By the time the quarter had ended, the rout was on as Bellingham pushed its advantage to 88-61. With the outcome no longer in doubt, the Slam used the fourth quarter as an opportunity to find minutes for all 12 players on its active roster. Forward Sterling Somers (6'5''-F) nailed a pair of three-pointers while guard Kosei Ban (5'6''-PG) sank the Slam's tenth trey of the day just as time expired. In addition to the seven former Western players who suited up for the Slam, current Vikings forward Trevor Jasinsky and center Logan Schilder saw time on the court for the Admirals. Stafford was one of three players to score in double figures for the Slam, which saw scoring contributions from all 12 active players. Hafford finished with 12 points while forward Anye Turner (6'8''-F-92, college: W.Washington) narrowly missed out on a double-double with 10 points and 9 rebounds. For Kitsap, forwards Dominic Green and Jeff Perkins led the way with 17 and 14 points, respectively. The Slam defense held the Admirals to 36 percent field goal shooting on the day. In keeping with the team-first style of play which led to many successful seasons in the International Basketball League, the Slam has posted a total of 55 assists in their first two Pro-Am games this season to lead the league. The Slam returns to action on Sunday as they battle Team N.F.A., which boasts a number of big names on its roster, including Spencer Hawes (7'1''-C-88, college: Washington), Dejounte Murray (6'4''-G-96, college: Washington) and Martell Webster (6'7''-G-86). Tip-off is set for 1:30pm at Seattle Pacific University's Royal Brougham Pavilion. Former Lynden Christian standout Paul Hafford (6'5''-G/F-84, college: Portland St.) has added another successful chapter to his basketball career. Hafford, a 2002 LC graduate, averaged a team-high 22.4 points, 7.3 rebounds and 4.8 assists per game this summer while leading the Bellingham Slam to a 7-3 record and a Seattle Pro-Am semifinal appearance. The sharp-shooting guard closed the season on a tear, scoring 40-plus points in two of the team's final three contests. Hafford began the dominant late-season stretch with a career-high 44-point performance in the Slam's regular-season finale, a 135-114 win over Guard Up on Aug. 20. The LC alum exploded for 33 first-half points and tied his own team record with 10 3-pointers in the game. He also had eight rebounds and nine assists. In a rematch the following day, Hafford posted a triple-double to lead the fourth-seeded Slam to a commanding 129-90 quarterfinal win over fifth-seeded Guard Up. Hafford finished with 21 points, 15 rebounds and 11 assists. The Slam's season came to an end on Saturday, Aug. 27, with a 111-108 semifinal loss to eventual champion Brand Black, which included former NBA first-round draft pick Terrence Williams. But Hafford turned in another impressive performance, recording 40 points and seven 3-pointers. He finished 37.6 percent from 3-point range for the season and 31-of-33 (93.9 percent) from the free-throw line. Hafford was one of 16 Pro-Am players selected to the compete in the league's All-Star Game, an Aug. 14 exhibition that included appearances by Seattle-area NBA players Jamal Crawford (6'5''-G-80, college: Michigan), Zach LaVine (6'5''-G-95, college: UCLA), Nate Robinson (5'9''-PG-84, college: Washington), Spencer Hawes (7'1''-C-88, college: Washington) and Dejounte Murray. Hafford also participated in the 3-point contest that preceded the game. This was the Slam's first time competing in the Seattle Pro-Am, one of the nation's premier summer basketball circuits. Over the course of the summer, Hafford and the Slam faced NBA star Paul George; former University of Washington stars Tre Simmons, Abdul Gaddy, Tre Simmons; and former Gonzaga University star Gary Bell Jr. The Slam were previously a member of the International Basketball League, where they won three consecutive titles up until the league folded in 2014. After not playing last summer, the Slam found a home in the Seattle Pro-Am. While at LC, Hafford led the Lyncs to a second-place finish in the 2001 2A state tournament and a third-place finish in 2002. He set a 2A tournament record with 118 total points in 2002. Hafford went on to play for North Idaho College and Whitworth University before playing two seasons of Division I basketball for Portland State University, where he graduated in 2007. Hafford played with the Slam for five seasons from 2008 to 2012 and won a pair of IBL titles with the team. He was a four-time IBL All-Star and ranks third on the IBL career points list. He also has played professionally in Romania, Norway, China and Australia.